John Henson (Left), Harrison Barnes (Middle), and Kendall Marshall (Right) have all decided to go to the NBA. 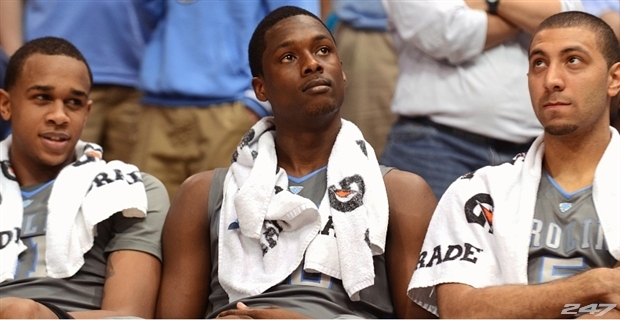 North Carolina players, Forward Harrison Barnes (Sophomore), Forward John Henson (Junior), and Guard Kendall Marshall (Sophomore) announced today that they plan to leave school early and join the NBA. The Tar Heels season ended Sunday when they lost to the number two seeded Kansas Jayhawks, 80-67. The three players were all in the top five in scoring on the Tar Heels this season. Barnes averaged 17.1 ppg, 5.2 reb, and 1.1 ast. As for Henson he averaged 13.7 ppg, 9.9 reb, and 1.3 ast. As for Marshall he averaged 8.1 ppg, 2.6 reb, and 9.8 ast. According to NBADraft.net, Barnes is projected to be selected 5th overall. As for Marshall, he’s projected to be selected 13th overall. And as for Henson, he is projected to be selected 16th overall. As for other former North Carolina player, Tyler Zeller who was a senior this year is projected to be selected 17th. “I plan to finish working toward my degree. That’s important to my parents, CoachWilliams and me. I can’t say enough about how much I’ve enjoyed my experience in Chapel Hill. This was a big decision and it will be a big change, but I’m ready,” said Henson. “Chapel Hill is a special place. Over the past two years I’ve enjoyed every single moment of my Tar Heel experience. The road we took to reach the Elite 8 in 2011 and again in 2012 were great team accomplishments. I am thankful to UNC fans, my teammates, and to have played for Hall of Fame Coach Roy Williams and the entire coaching staff. Now it’s time for the next course of my journey. Although I may be giving up my eligibility, I will continue to pursue my degree. I love this university and will always be a Tar Heel,” said Barnes. Quotes from North Carolina’s athletic page. John Henson, according to head coach Roy Williams has about a 50/50 percent chance of playing on Sunday. With just little over a week after North Carolina’s forward, John Henson sprained his wrist during a game against Maryland in the ACC Tournament on March 9th, Henson has still yet to play. Just eight days after spraining it, Henson has missed three games and possibly soon to be four. After missing the rest of the ACC Tournament in games against N.C. State which North Carolina won 69-67 and against Florida State which North Carolina lost, 85-82, Henson was very questionable coming into the second round of the NCAA Tournament against 16th seed Vermont as head coach Roy Williams told reports a day before the game that he wasn’t very convinced. “I’m not convinced,” Williams told reporters Thursday. “We’re going to see how it feels tomorrow, and decide from there.” said Henson on Thursday. Though, despite trying to stay optimistic that he was going to play, Henson would miss his third straight game on Friday as he watched his team defeat the Catamounts of Vermont 77-58. Some reports came out as Henson’s absence was just a precautionary reason, however one day after advancing to the third round, head coach, Roy Williams is saying otherwise. “He did continue getting rehab last night but when you’re sitting there eating, there’s not a lot of things that you do when you’re eating your meal that resembles what you’re asked to do with a basketball,” Williams said. It would be Henson’s fourth straight game missed if absent from the North Carolina line-up come Sunday and it would be a very key absence for a team that’s facing a tough Creighton team. Williams also added to reporters on Friday, that his percentage of Henson playing come Sunday is about a 50/50 percent chance. However, who knows if those percentages changed or not within the last 24 hours. Though, North Carolina will take the court with or without, Henson come Sunday against the Creighton Bluejays at 5:15 P.M. Eastern Time on CBS.